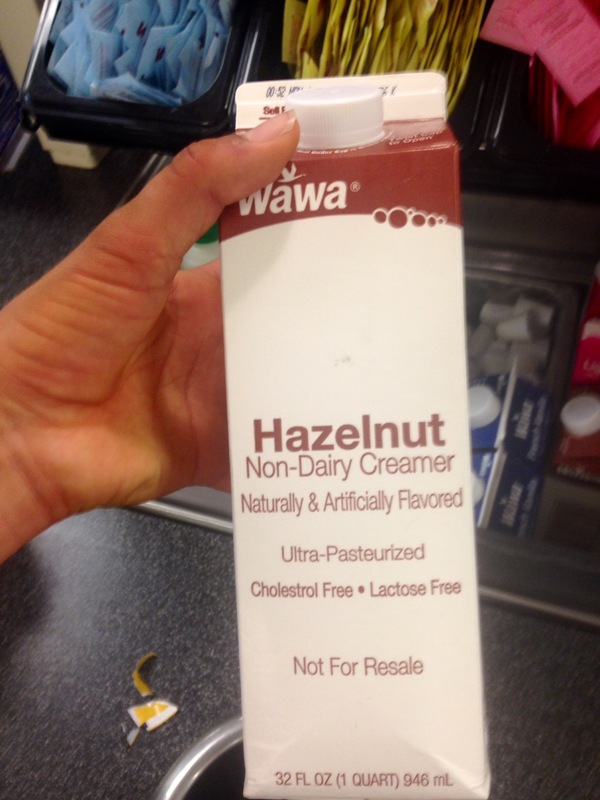 When I think back to all of the delicious food I ate this 2014 holiday season, one thing stands out in my mind. No, it’s not the Christmas turkey or ham, nor is it the sweet potatoes and stuffing. Okay, before you start making faces at me and turn your nose up in disgust, you’ve really got to take a look at this recipe. I liked it so much, I made it twice more after its original (and thankfully successful) attempt. When I made it for our second Christmas family dinner on the 27th of December, it was the only dish that was polished off! (And to put this in perspective, four days later, we are still working on the leftovers from the dinner). When a few relatives asked for the recipe, and my mom asked me to make it again a couple of nights ago, I knew I had to post the recipe for you all. So, what is this great salad I speak of?!?!? Friends, I present you with… Warm Winter Squash Kale Panzanella. Right now you’re probably thinking: what in the world is Panzanella? Well, I had no idea, but after having found this delicious recipe by Cookies and Kate on Pinterest, I knew I had to give it a shot. The most unique part about this recipe is the rosemary. Along with the goat cheese, it adds so much flavour to this salad dish! It honestly reminded me of a healthier version of stuffing. 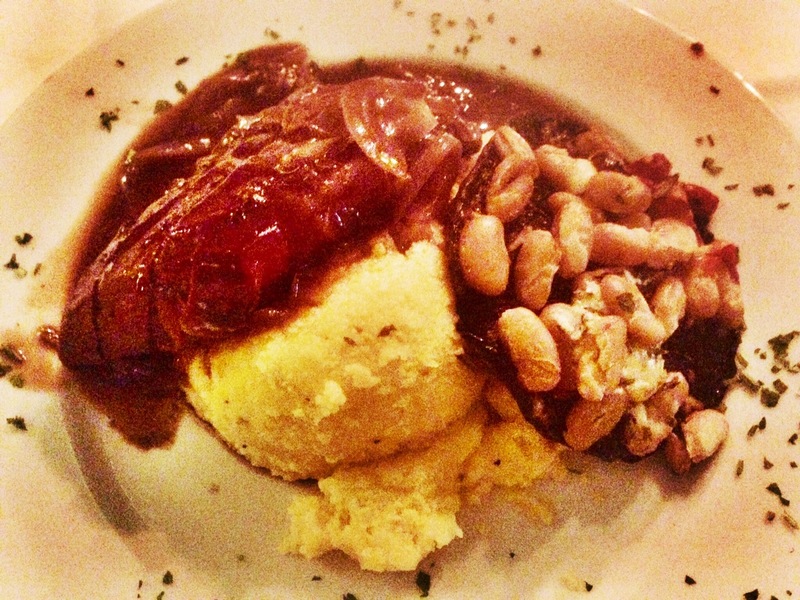 I also loved how easy it was to substitute certain ingredients to make the dish customizable. For example, the first time I made it I used some type of winter squash, the next time a butternut squash, and the final time a sweet potato! 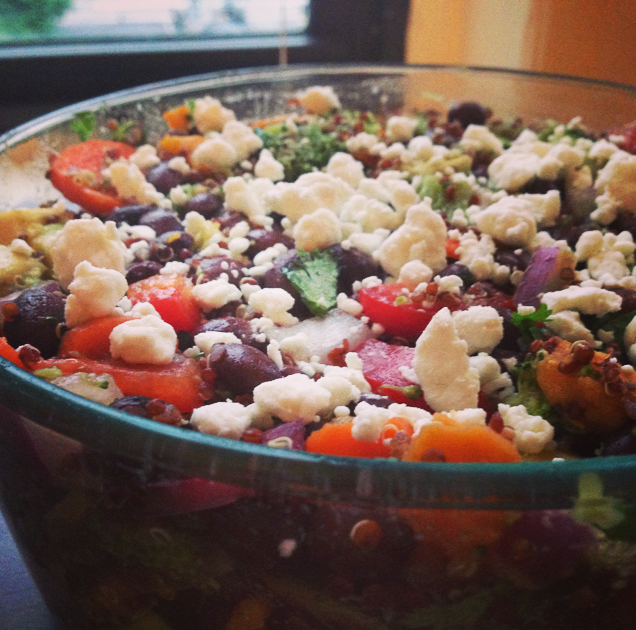 If you’re looking for a hearty, delicious winter salad, you’ve got to try this. My family and I loved it, and if you like kale and balsamic, I have a feeling you’ll love it too! Serves 2-4 people, depending on whether served as a side or a main dish, and on how hungry you are! Place mostly baked squash, bread, seeds, and onions on a baking sheet. Drizzle olive oil on top and toss until all ingredients are evenly coated, and then sprinkle rosemary and salt/pepper. Bake for roughly 10 minutes, before removing from heat to flip ingredients, and baking for another 7-10 minutes or so, until bread is well toasted. When bread is toasted to your liking (and they resemble croutons), remove pan from oven. While the “hot” items are in the oven, massage kale in small batches. This will make the leaves much less “rough” and will also decrease their volume by a lot. If you need a tutorial on how and why you should massage kale, check out this article by the Huffington Post. Add dried cranberries to the kale. Do NOT add in goat cheese yet! In a small bowl, combine all ingredients and stir until thoroughly mixed. You may wish to taste the dressing to make any necessary adjustments to suit your liking. For example, I much prefer balsamic over mustard, so I tend to use more of it. 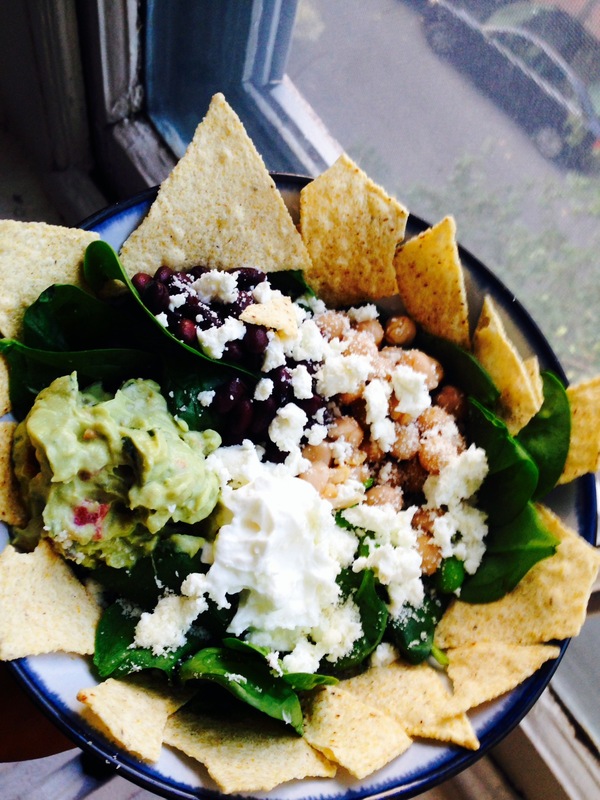 In a large salad bowl, combine cold and hot ingredients. Drizzle dressing over salad, and mix well until all leaves are well coated. In an oven or microwave (make sure the bowl is microwave-able safe! ), heat salad until lukewarm. This should take about 5-7 minutes in the oven (watch it carefully), and 1-1.5 minutes in the microwave. Remove salad from heat, and crumble goat cheese on top immediately before serving. Serve salad immediately when warm. Enjoy! Also, it is WEDNESDAY, which means I can also combine this recipe with some awesome What I Ate Wednesday eats! I’m liking up with Jenn for WIAW from Peas and Crayons! Be sure to check out her website for not only her WIAW eats, but also others’! Coconut flakes, which I turned into coconut CHIPS by baking them! And, last but not least, HAPPY NEW YEAR to you all! I hope you all have a fabulous time celebrating, whether you’re staying in, going out, or doing absolutely whatever 🙂 . Here’s to 2015! Do you like kale? Do you cook with it much? I love love love kale!!! I absolutely adore how robust it its, and how it can withstand dressing without wilting! Do you know what “panzanella” is? Have you ever made it? WOW I forgot how busy school is. Classes, reading, blogging, and squash makes up for action-packed days. I think I need a personal assistant! (Or maybe I just need to buy a planner…). Anyway, let’s move on to some food related things! 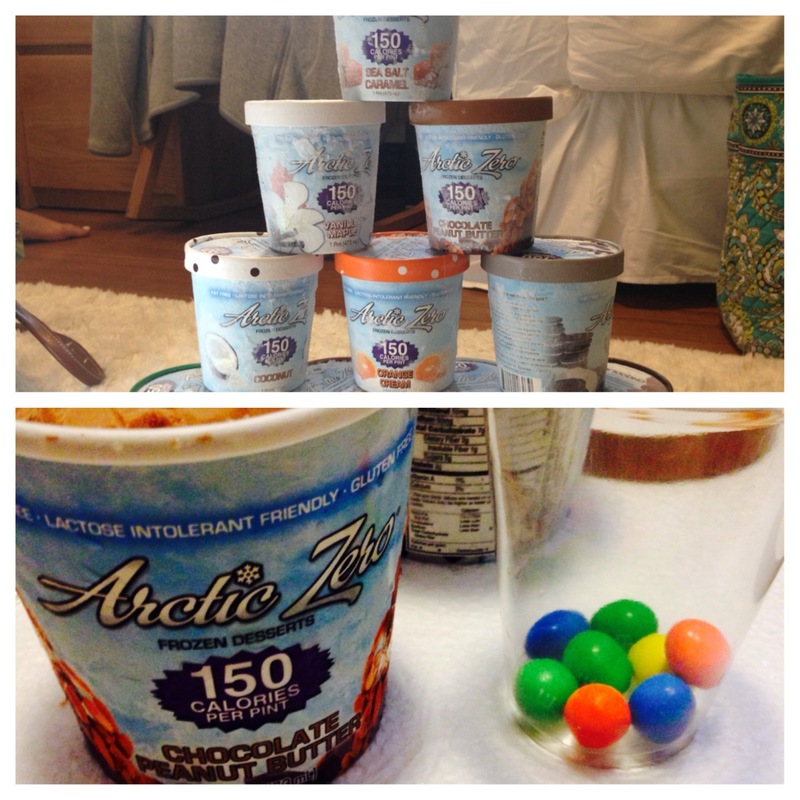 Arctic Zero Giveaway- 2 days left to enter! Alright, back to food things! Now that I’m back at school, I no longer buy my own peanut butter, which means that I am at the mercy of those who have all the power. (Having control over the food is a powerful position!). 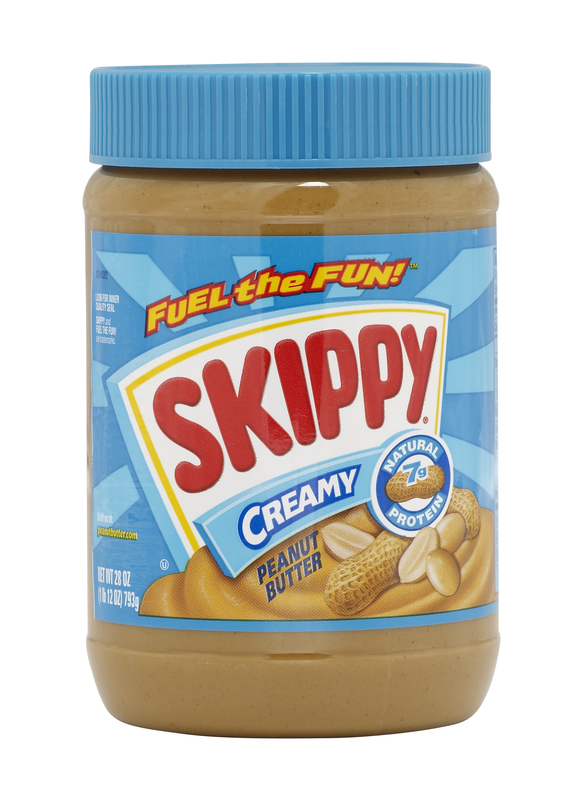 In any case, the powers that be tend to always buy Skippy peanut butter. To the untrained peanut-butterer (<– is that a word?? ), Skippy is what normal peanut butter tastes like! 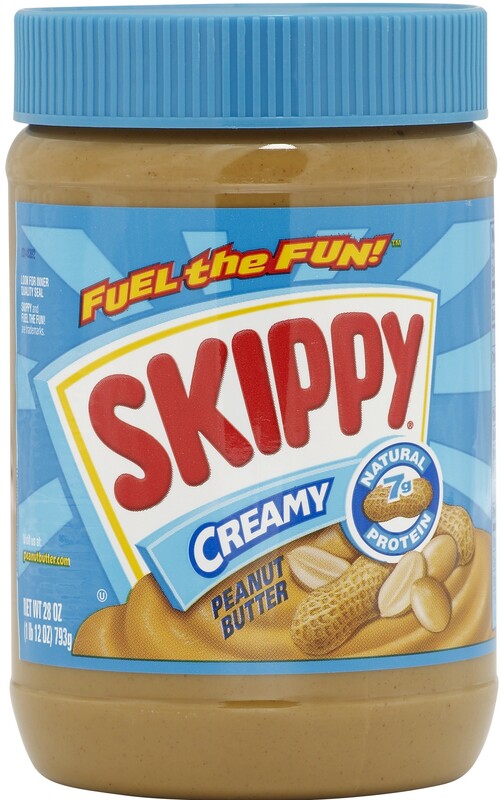 However, over the years I have come to appreciate pure, natural peanut butter, and find Skippy too sugary. 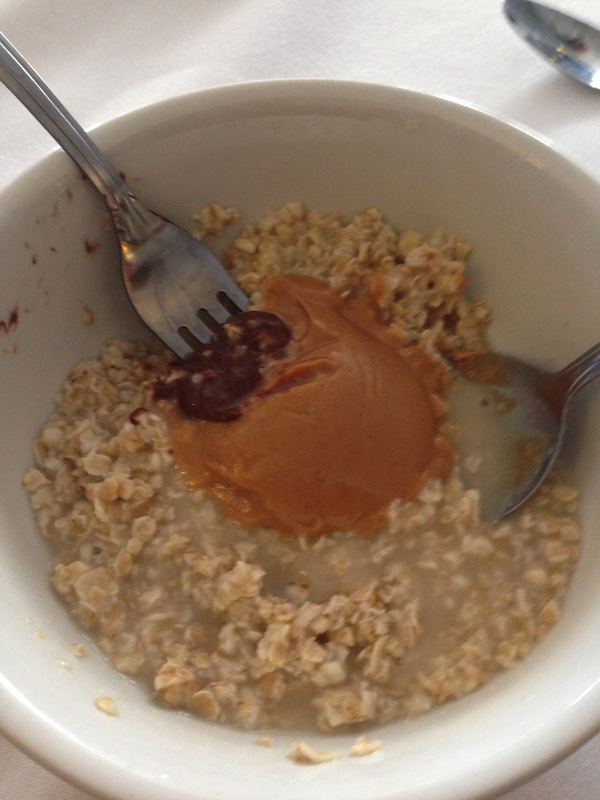 Lately, I’ve been rocking the PB + instant oatmeal combo for breakfast, and afternoon/evening snacks. They key to making this snack delicious is making sure the oats are hot so that the peanut butter melts, and turns into PB sauce. 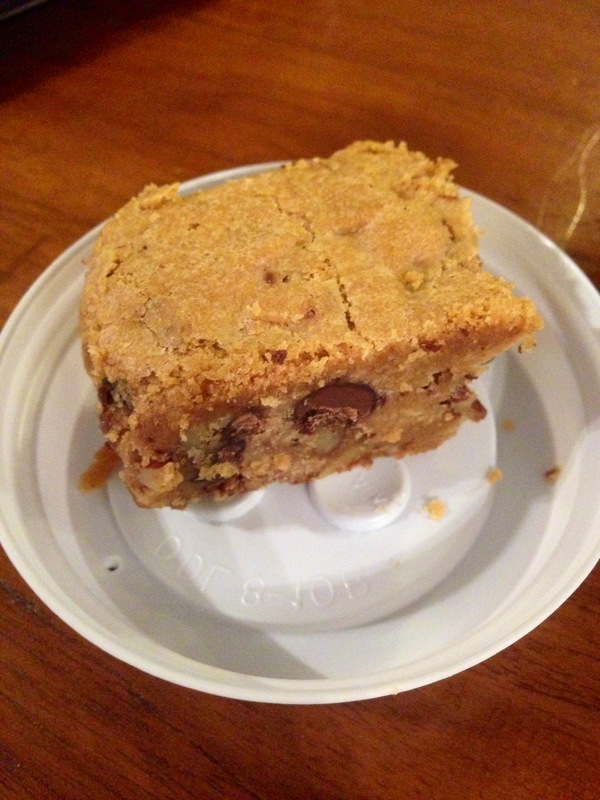 I’ve also had a couple of these walnut+chocolate chip blondies. 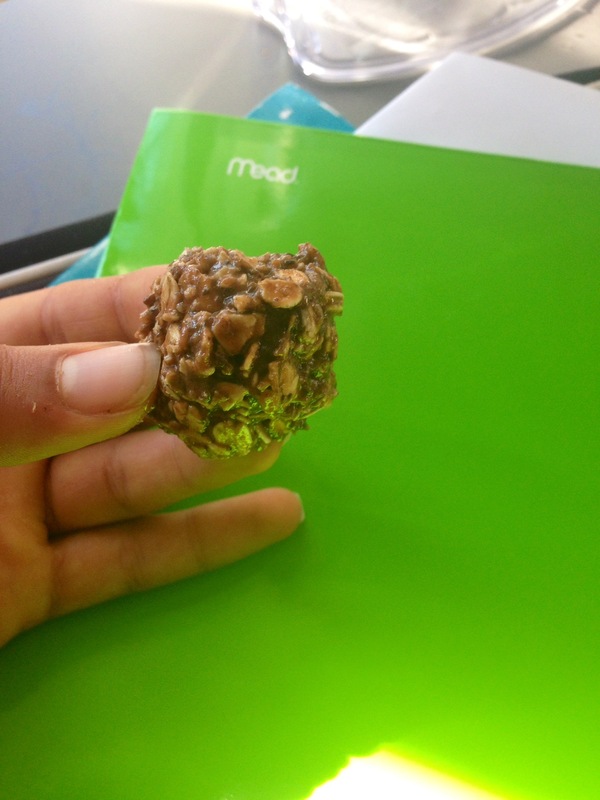 This morning I made myself a quick chocolate cookie dough protein ball by combining peanut butter, chocolate whey protein powder, a little milk, and oats. 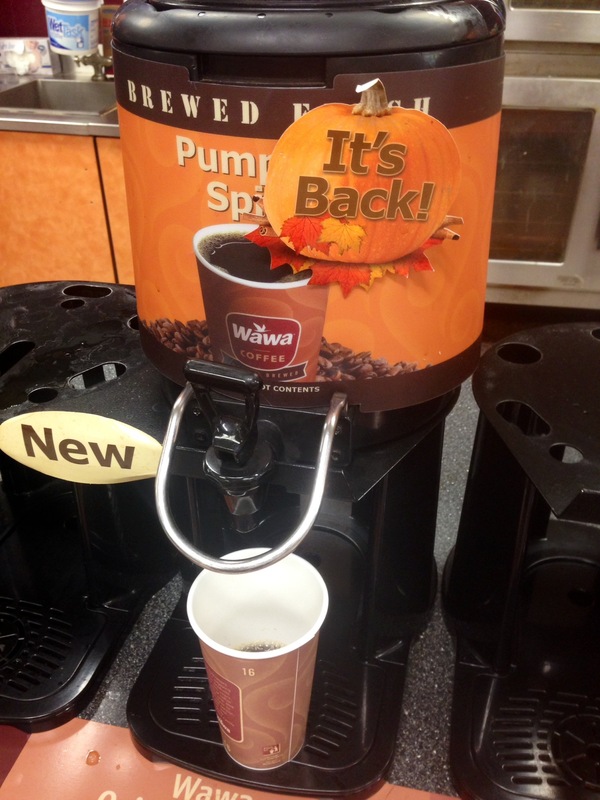 I had 3 of these for breakfast this morning, plus a small protein shake (unpictured), and some of Wawa’s Pumpkin Spice coffee! The other day I pretty good lunch the other day of spinach salad with chicken, edamame, red cabbage, and sliced almonds, chicken kabobs, and breaded eggplant. 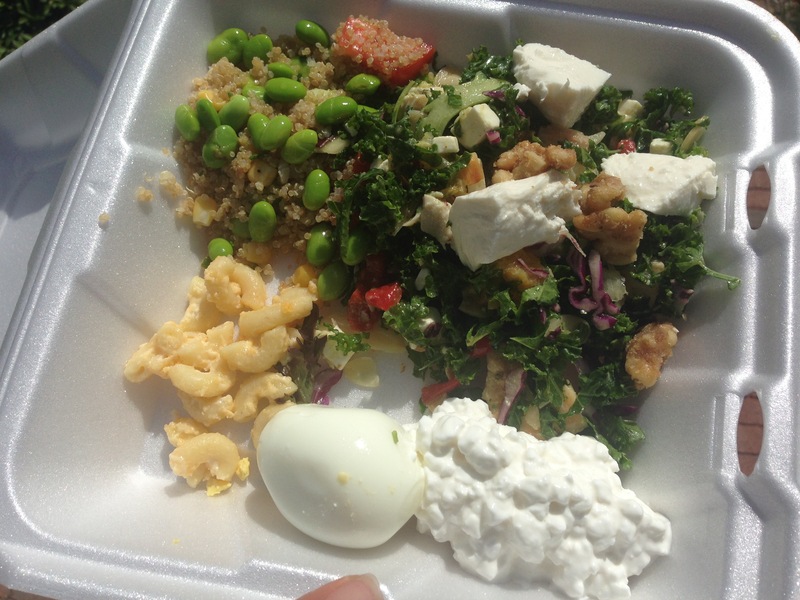 Today lunch was a couple hardboiled eggs, quinoa salad with cucumbers, tomatoes and edamame, kale salad with feta, mozzarella, edamame, chicken, and purple cabbage, and cottage cheese on the side. I couldn’t resist adding a little mac and cheese to my container plate at the last second. (I ate most of it before snapping the picture). I also threw a little extra edamame into the mix, as well as a few candied walnuts. Dinner last night was flank steak, polenta (which I left to the side), roasted portobello mushroom with white beans, and roasted vegetables (unpictured). Well that sums up some of my recent eats from the past few days! I’ve got to run off to class now, have a great rest of your Wednesday, and thanks to Jenn for hosting What I Ate Wednesday! Be sure to check out her blog, Peas and Crayons for some more WIAW posts! What brand of peanut butter (or other nut butter) do you prefer? Do you have a preference? I might have to dedicate an entire post to peanut butter, (and nut butter in general), because I could talk about this topic for days on end. Lately I feel as though I’ve been seeing tons of bloggers (like Brittany and Jen) post about Mexican food, and I finally decided to do something about it. Last night I made a Taco Bean Salad! I’d say that along with Indian, Mexican food is one of my favourite types of ethnic cuisine. As I was making my salad last night, I thought about all of the reasons why I love Mexican food, and ended up making a list. One word: Guacamole. Warning: I get defensive about my guacamole. Please don’t ever steal my guac. I will be very upset with you if you do. Actually. I absolutely adore Mexican spices. I could eat taco-seasoned chicken for days on end. I quite like beans as well, I’ve realized. Refried beans with melted cheese on top? Go try it now, please. 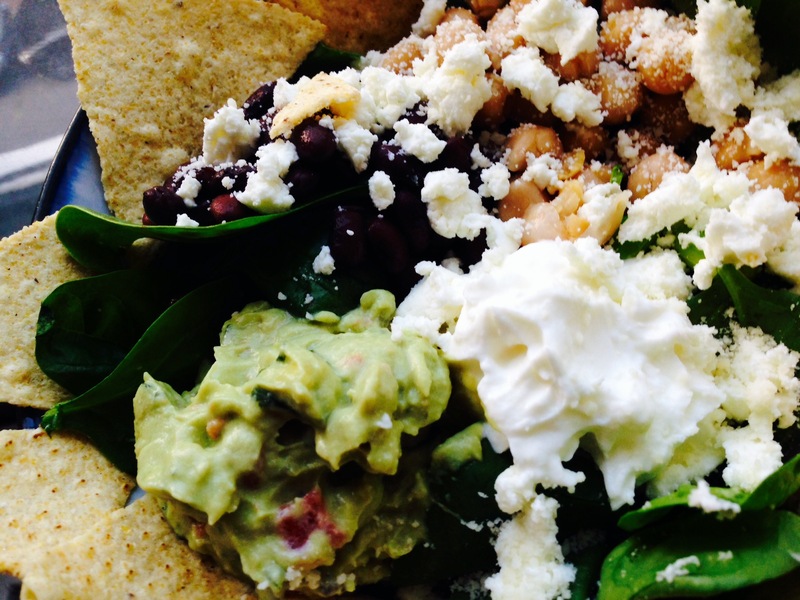 Mexican food can easily be “healthified“. I have great childhood memories of me eating tortilla soup. There really is nothing like a good tortilla soup… I avoid getting it at non-Mexican joints, because it just doesn’t measure up. How many different ways can you make tortillas taste so great? Chips, Enchiladas, Quesedillas, Tacos, Burritos… the list seems pretty much endless. Well there you have it. Most of the reasons why Nicole likes Mexican food! 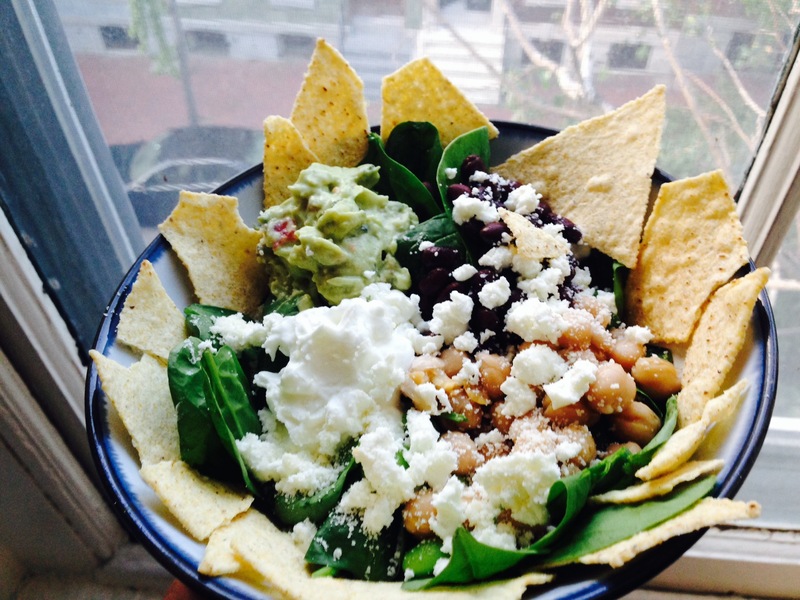 Now that I have justified my obsession, let me share my dinner from last night: Taco Bean Salad! If I had had them on hand, I would have added a few other ingredients to my bowl, such as salsa, tomatoes, and peppers, but sadly I didn’t pick any up at the store today. In any event, this dinner was still a winner, mostly because of all the toppings! I never had any “boring leafy bites”, which sometimes happens with salads. Gotta love hearty salads! If not, what other kind of ethnic cuisine do you enjoy? If yes, what about Mexican food do you like the best? Do you have a random assortment of vegetables in your fridge that need to be used up? If you do, grab some quinoa, get chopping, and in no time you’ll have a delicious vegetarian, healthy meal ready for eatin’! I was having a hard time deciding (as per usual) exactly which vegetables to include in this salad, so finally I figured, hey, why discriminate? Let’s include them all! I managed to snap a picture of most of the vegetables I included alongside the quinoa. Also, a little note about quinoa: I used to be scared of cooking quinoa. Why? Because I thought it took forever to cook. Guess what? It doesn’t! And, it’s very, very simple if you cook it in the microwave! 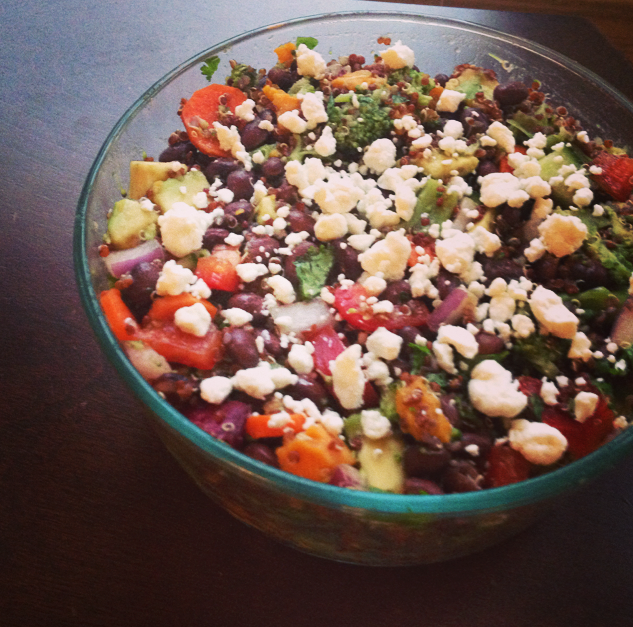 Cooked broccoli, avocado, cilantro, cooked quinoa, red pepper, carrots, cucumber, red onion, and sweet potato. The most tedious part of assembling this meal is the chopping, but honestly once you get out your knife and cutting board, it all goes fairly quickly. Plus, the end result is very, very worth it. 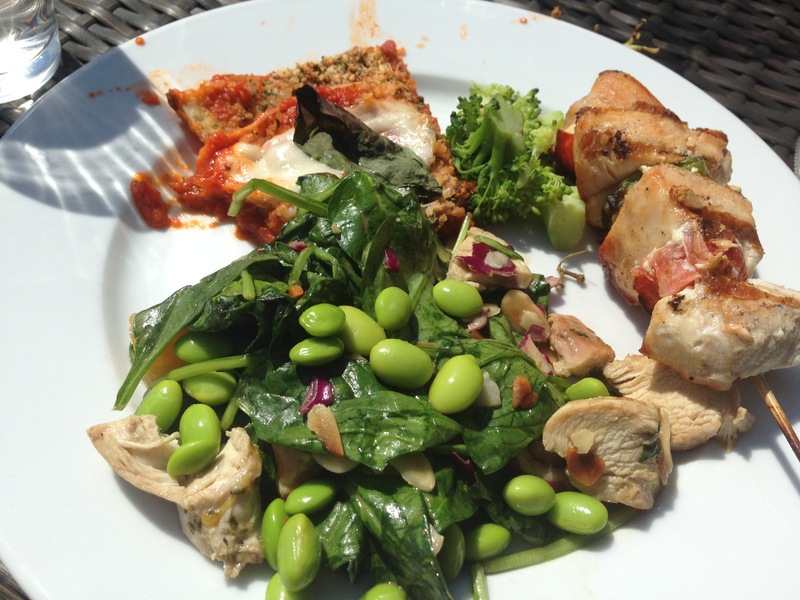 Veggies, protein, whole grains, and healthy fats. What more could you ask for in a salad? *Note: the ingredient list and directions look daunting, as they are both rather long, but trust me when I say it’s super straight forward! Cook quinoa either on stovetop or in microwave by adding 1 to 1.5 cups of water and cooking on high for about 10 minutes. Make sure to check periodically and stir, so that it doesn’t boil over. Assemble remaining ingredients except sesame oil and vinegar, and combine in a large salad bowl. Set aside. In a small bowl, combine oil and vinegar. Set aside. Carefully remove quinoa from microwave or stove and pour out any excess liquid. Alternatively, you can cook it a little longer, as the quinoa will keep absorbing the water for a while, and some water will evaporate as well. Let sweet potato cool for 5-10 minutes until unwrapping it, as it will be very hot. Once it has cooled, remove the skin and cut into cubes. 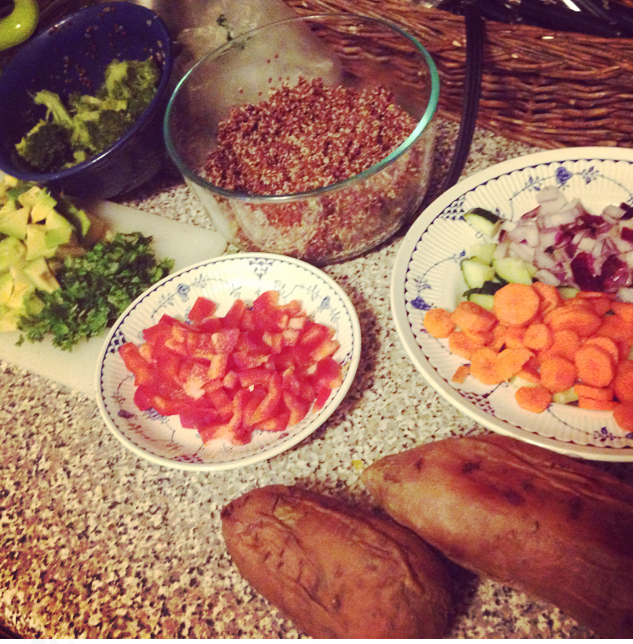 Once sweet potato and quinoa have cooled, add them to the vegetable bowl and mix ingredients together. Pour oil and vinegar dressing on top and mix thoroughly until evenly coated. Top with goat cheese if desired, and dig in! 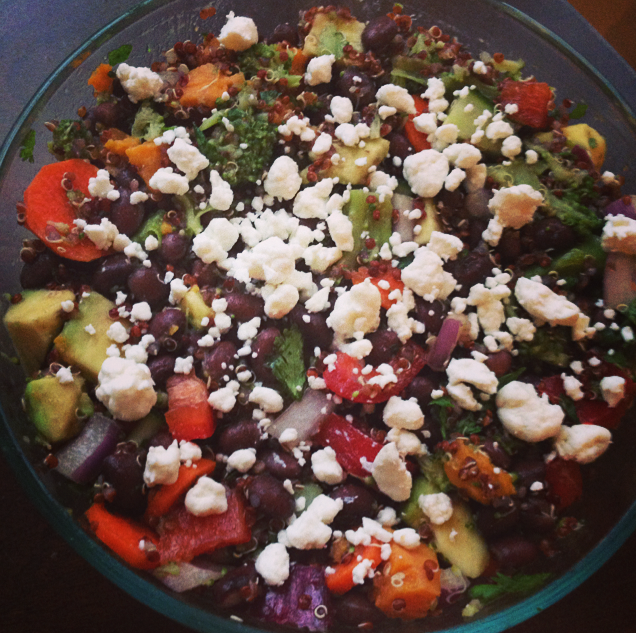 This salad was just as good the next day, thanks to the super-absorbance power of the quinoa! Ever since my delicious lunch at Westville in NYC on Sunday, I can’t get smoked salmon out of my mind. 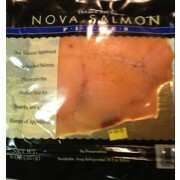 So, when I saw my favourite fish on sale at a decent price today, I had to go for it! When I got home from squash today, I knew I wanted something cold for dinner. There was no way I was about to heat up the apartment by cooking a hot meal, while I’m trying to cool it down with AC! My first thought was to make a smoothie, but since I am still blender-less, that was a no go. Next best thing? A salad! On my grocery expedition today, I also picked up my new green leafy vegetable for the week, arugula! 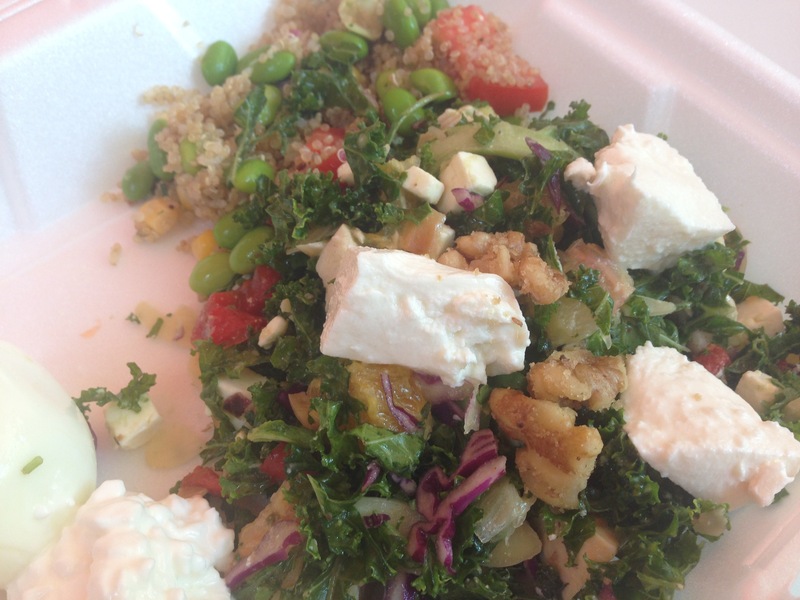 (Last week’s was kale, and towards the end I was getting a little kale-d out). Combine olive oil, lemon juice and red wine vinegar in a small bowl and mix well. 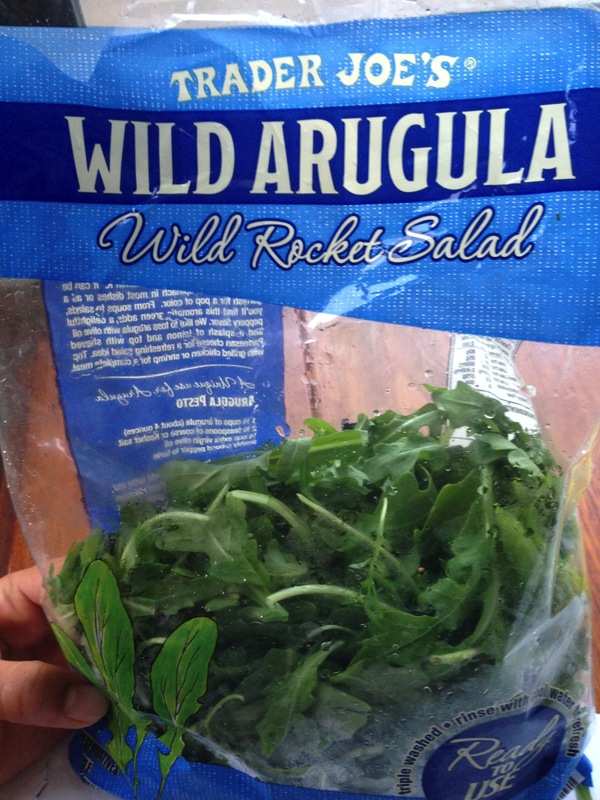 In a medium salad bowl, pour salad dressing over arugula and use your hands to mix until it is evenly coated. 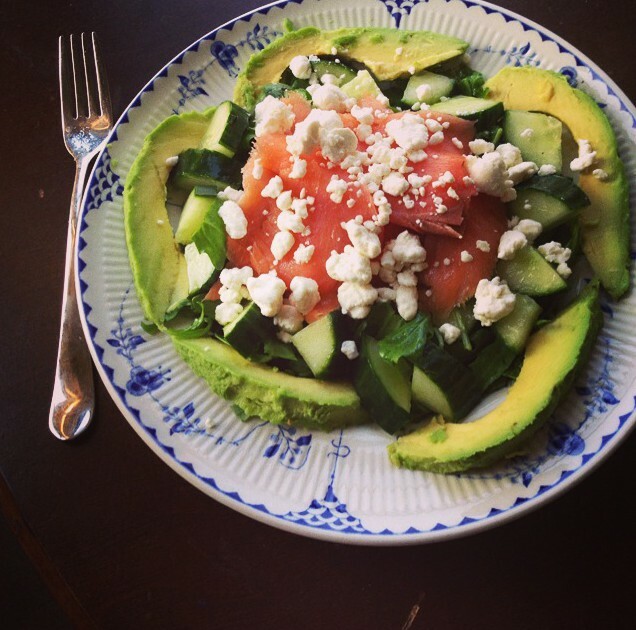 Top with avocado, smoked salmon, cucumber and goat cheese. 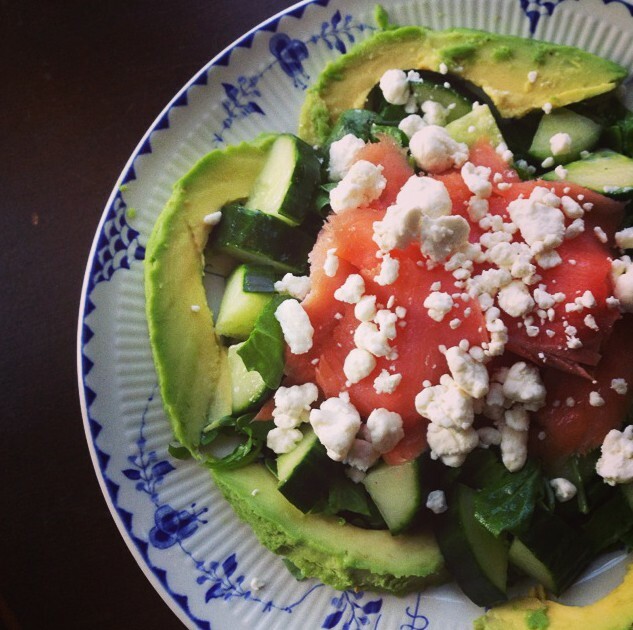 Thanks to the avocado and salmon, this ended up being a pretty substantial salad full of Omega-3’s! I’ve also got a recipe for a quiche in mind, which uses these 3 main ingredients. I don’t think I’ll ever get sick of the smoked salmon and goat cheese combo! Question: Are there any combinations you will never get sick of? For me, it’s chocolate, peanut butter, banana. Til death do us part.